Thengai / coconut burfi is one sweet that we make every year for Diwali at home. 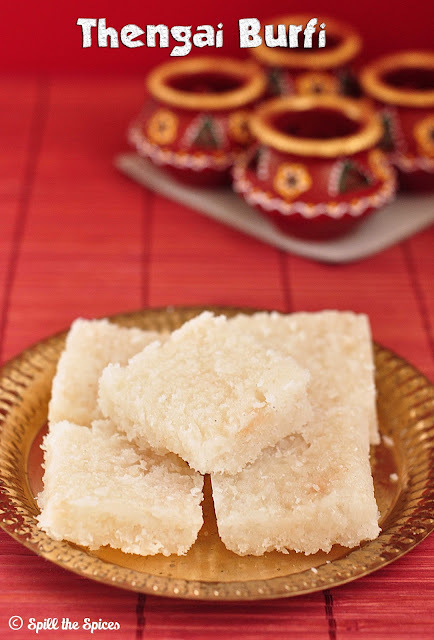 Thengai burfi is a very quick and simple sweet with coconut, sugar and cardamom. 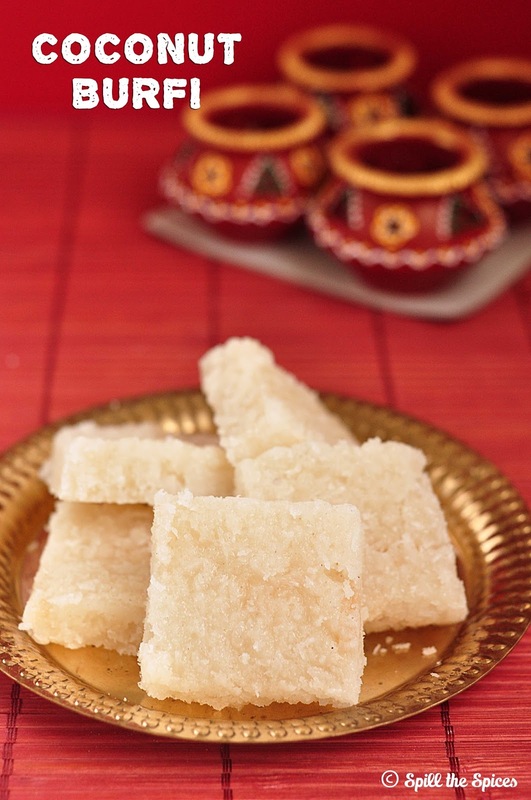 Unlike other Indian traditional sweets which require lots of ghee, this coconut burfi needs just a tablespoon of ghee. Making thengai burfi is so easy that even beginners can try this sweet. The burfi tastes best when made with fresh coconut but it comes out well with frozen shredded coconut too. Check out the notes and tips section if you using frozen coconut. So try this delicious coconut burfi for this Diwali and enjoy with family. 1. Pulse the coconut in the mixie jar until coarse. Do not make into a paste. Grease a plate or tray with ghee and set aside. 2. Take a wide bottomed non-stick pan and add sugar, 14/ cup water. Mix well till sugar dissolves completely. Keep stirring and cook till one string consistency is reached. 3. Add coconut and mix well. Keep stirring till the mixture starts to thicken. At this stage, add ghee and cardamom powder. 4. Keep stirring until it thickens and forms a mass. Remove from heat and immediately pour into the greased tray. When it becomes slightly warm, cut into squares. To check one string consistency, wet your fingers and take a drop of syrup in between your thumb and index finger. If a single string is formed between the fingers, it means syrup has reached one string consistency. To get white coconut burfi, while scraping the coconut do not grate the brown portions. If using frozen coconut or dry shredded coconut, add ¼ cup water and microwave for 30 seconds. Drain excess water and use this water to dissolve sugar. simple and rich sweet! perfect for last min preparation! looks delicious,love anything with coconut..yummy! Coconut burfi looks so delicious!! My mom makes similar burfis only.. Perfectly made thengai burfi. Looks delicious and yummy. Nice pics too. Perfectly done, just so delicious..
Thengai burfi looks delicious and yummy... Perfectly done.. Perfectly done dear.. Looks so yummy and tempting.. Love the cute pots.. Perfect coconut burfis.. I just love them, they are so juicy and addictive.. These sound delicious. I am a big fan of anything coconuty!